In Paris we visited the Louis Vuitton Foundation to see the large collection of works that had been brought over from MoMA for the exhibition “Etre Moderne”. From its earliest days, MoMA has collected popular art, and here were photos by Walker Evans, Lisette Model and Alfred Steiglitz. Steamboat Willie, the first Micky Mouse film, was made partly at the suggestion of MoMA staff, and was on show. 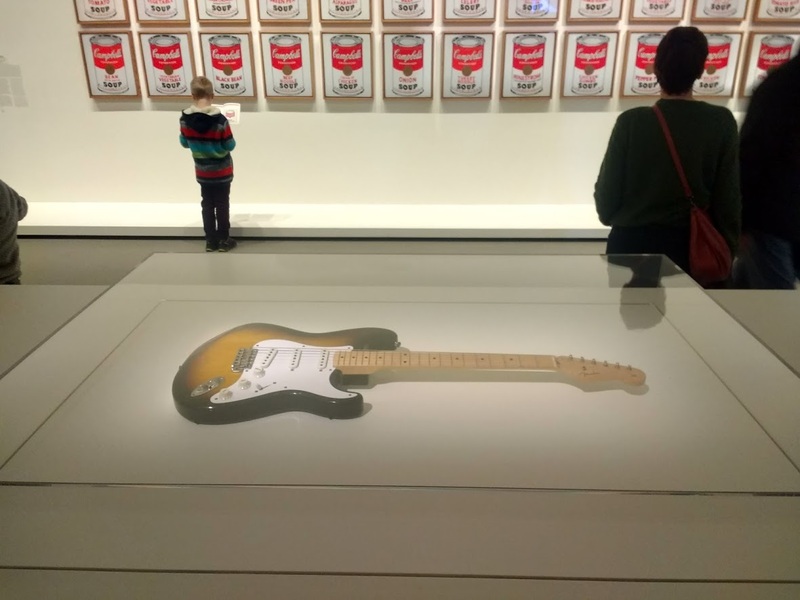 No surprise, then, to see an early Fender Stratocaster displayed near to Warhol’s soup cans. Originally aimed at country musicians in the 1950s, the Stratocaster was quickly taken up by rock guitarists and has been made in the millions, virtually unchanged, over the last seventy years. A multiple? A readymade? Like Warhol’s soup cans, an icon.